presents the "Colored Paint-On Bandage"
Now why would any kid want a bandage when they could simply apply a little Boo Boo Goo? What is BooBoo Goo you ask? From what I can tell, it's kind of like applying colored super glue to a cut or scrape, instead of using a bandage. This rather interesting product was invented by Kiowa Kavoit, a 6 year old little girl with very big dreams. Kiowa is one of the youngest Shark Tank Contestants to ever appear on the Show, which should make for a rather interesting round of negotiations with the Sharks in how they handle such a young entrepreneur. Considering this Episode 516 is completely devoted to young entrepreneurs, I could see why the producers might choose a very young entrepreneur, but 6 years old might be stretching just a bit when it comes to making a deal with the Sharks. Fortunately Kiowa's dad is Andrew Kavoit, a famous actor from "As the World Turns", who will also be inside the Shark Tank as she pitches the Boo Boo Goo paint-on bandages. This Shark Tank Episode featuring All Young Entrepreneurs was filmed last year, so I'm assuming Kiowa is now old enough to have started grade school by now. When it comes time for "show and tell", she most definitely has something to talk about considering Kavoit will become one of the youngest contestants seen on the Shark Tank Show. As far as Boo Boo Goo getting a deal with the Sharks, man this is a tough one. On one hand, how could the Sharks possibly say no to such a young inspiring entrepreneur with a great idea how to turn boo boos into Ha Ha's? (Check the site for that one) On the other hand, how young is too young when it comes to starting and running a business that the Sharks are willing to seriously invest in. 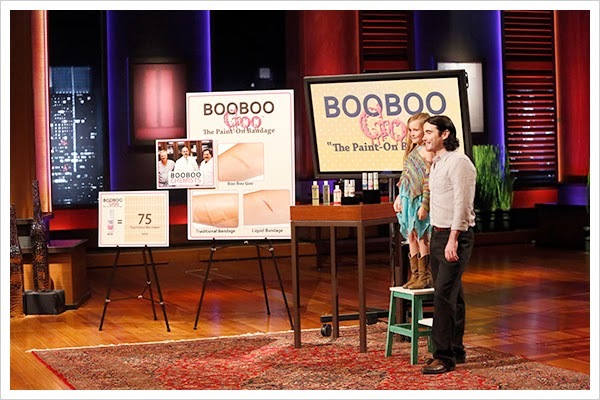 Kiowa may be one of the youngest entrepreneurs ever seen on the Shark Tank, but it looks like she already has a few key financial partners in place to make Boo Boo Goo a success. Along with her dad Andrew who's calling most of the shots I'm assuming is Dale Seefeldt and Billy Jurewicz, who have also invested in this paint-on bandage product. I think this is a great idea. If there was a bigger choice of colors, teenage girls would likely flock to this just to PLAY with. Add black, and you would get the EMO, and GOTH characters. Skin tone-in a world where there are all kinds of ppl-there is only one color for skin tone? Get over what? That was a good observation. Even white people are more than once color. If you go on the website you will see there are actually three different skin tone choices. There are three different skin colors. Still limited though, at least one more truly dark shade would be helpful for darker skinned people because overall the tone of the "dark" natural is still more of a mocha. Aside from the skin colors they could use a more traditionally male color too, or at least not just pink and orange if kids and teens are a major target. What I was really wondering though was how you would get this off once you were actually ready to remove it. Their website is skeletal and has no answer to this or much else. It was so much fun seeing "Paul" again as a grown man, although he still looks 16. He was my reason for watching ATWT so long ago. Good luck Andrew and Kiowa. BTW, being FROM Iowa, I love the name. This was James and Barbara's son, Paul on ATWT's??? WOW. He looks great. Hope he makes a huge success of this with Mr. Wonderful! Andy does not look any older than he did as "JD" on the best western Magnificent Seven. Kiowa is adorable. Much success with your product, and keep inventing. I truly don't see this product as being a successful one. I know if I were a kid and my dad or mom asked me what band aids I wanted, I would go for a band aid that had some character on it, not some liquid bandage. The way I see it, the product will fly off the shelves for a few weeks, but that would be the extent of this product's success. As far as I can tell, this product is a novelty at best. Actually, a lot of kids hate regular bandaids because they at some point have to come off and hate the pain it causes when it pulls at the hair. Even bandaids with fun characters hurt when they have to come off. My daughter fights and cries every time I have to take a bandaid off, and will even go so far as to try to tape it back on to prevent having to remove it, which then of course creates more tape to eventually remove. I also tried the standard over the counter liquid bandage and it stung so badly that she was crying for me to never use it again. I would buy this in a heartbeat, but unfortunately their sales are on hold right now as they are working on their deal with a major company for distribution. In fact, I am online right now because I was going to buy some, but was disappointed that it is not yet for sale. I am allergic to bandaids. The adhesive makes me itch-BADLY! I can't wait to try it!! They did say 3 and up did you try it?